Amazon Kindle 2, was released on February 24, 2009. Amazon Kindle 2 is the latest generation of Kindle wireless ebook reader. Kindle 2 is available at Amazon online store. We will review what is new in Kindle 2. Kindle 2.0 share a lot with kindle 1, but there are a number of differences. Kindle has since been joined by the bigger Amazon Kindle DX. 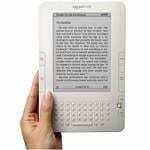 A new Kindle with global wireless capability have been launched by Amazon. Amazon has introduced a Kindle 2 with global wireless at $279. This Kindle is targeted at the US as well as international market and Amazon ships this new Kindle to over 100 countries. Kindle with global wireless delivers content via HSDPA/GPRS/EDGE networks in over 100 countries. Note that Kindle 2 with US wireless delivers content via EVDO network in the US. Latest generation Kindle with a thickness of 0.36-inch is slimmer than previous generation. Kindle has about half the thickness of Kindle 1. Slimmer and sleeker Kindle makes for easier handling. Latest Kindle is as thin as most magazines. Latest generation Kindle weighs 10.2 ounces (289.17 grams); this is about 0.1 ounces (2.8 grams) lighter that previous generation. This may not be considered as significant, however when you factor in your ability to carry up to 1,500 books on Kindle 2 more than 7 times the capacity of previous generation Kindle, you will begin to appreciate the achievement. Although the Display of the two generations share a lot in common. 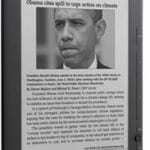 The 6.0-inch E-Ink electronic paper display, with a resolution of 600 x 800 pixels at 167 ppi is retained in latest generation Kindle. However, Kindle 2 display supports 16 shades of grey (compared with 4 shades in Kindle 1), hence your images, text, and photos are clearer and sharper. Kindle reads like ordinary paper and uses no backlighting. It can be read in Sunlight with no glare. Kindle 2 can hold more than 1,500 books, 7 times more than the 200 books capacity of Kindle 1. You can now carry your whole library in your bag when traveling. Of course as in Kindle 1, all titles bought at Amazon online Kindle store is automatically backed up at your personal media library to enable you make room for new titles on your Kindle. Books stored in your personal media library can be downloaded wirelessly for free. Kindle store has over 350,000 titles. Kindle Read-to-Me feature is a Text-to-Speech feature that reads your Kindle books, magazines, blogs, and newspapers to you. So with latest generation Kindle, you do not only read your favourite titles, you can also listen. You can even switch from reading to listening and vice versa and Kindle will automatically save the spot you stopped reading or listening and start from the exact spot when you resume reading or listening again. Amazon Kindle 2 comes with a new feature Whispersync. People with two or more Kindles or Apple iPhone or iPod Touch will appreciate Whispersync. With Whispersync technology, you can read with one Kindle device (or iPhone/iPod Touch), and pick up a second Kindle device (or iPhone/iPod Touch) and continue your reading exactly where you left off in the first device. A special software is reqiured to enable Whispersync on iPhone or iPod Touch. Kindle now supports conversion of your personal PDF file to Kindle format. However, Amazon warns that this is still experimental and may not work for complex PDF files. Other formats currently supported include Microsoft Word, HTML, TXT, JPEG, GIF, PNG, BMP, PRC and MOBI files. Files are converted and wirelessly delivered to Kindle at 10 US cents per file. Files can also be converted for free by sending attachments to a special Kindle email, you can then manually download to Kindle via USB. According to Amazon, latest generation Kindle has 25% more battery life. Battery can last for about four days with wireless on. However, you can switch off wireless connection to experience more battery time. According to Amazon, Kindle Battery can last for more than two weeks with wireless connection off. One complaint that was common with Kindle 1 was accidental page-turn. Amazon has addressed this problem in Kindle 2 by bending the page-turn buttons inside. This Amazon believes will eliminate the problem. Kindle new 5-way controller makes it easy to browse through articles and papers. With this new 5-way controller, navigate through your text and pictures. Pages turn faster on the average. Unlike Kindle 1 that come with a book cover as part of the package latest generation Kindle does not have book cover as part of the package, you have to buy it separately. Amazon currently offers Kindle 2 leather book cover for 29.99 USD. Memory card: Increase the quantity of Kindle titles you can carry on your e-book reader. Kindle Solar charger: Charge your Kindle anywhere, all you need is sunlight. Amazon Kindle 2 is available for order, for current prices, reviews, specification, and features of this wonderful electronic reader, visit amazon.com. You can also buy Kindle at the store.